All Del Sur homes currently listed for sale in Del Sur as of 04/22/2019 are shown below. You can change the search criteria at any time by pressing the 'Change Search' button below. If you have any questions or you would like more information about any Del Sur homes for sale or other Del Sur real estate, please contact us and one of our knowledgeable Del Sur REALTORS® would be pleased to assist you. "Imagine flying in and landing on your very own private runway on a one-of-a-kind ranch just 40 aerial miles north of Los Angeles, and 30 scenic minutes north Valencia and the San Fernando Valley. Built in 1924, this hidden 5500 sf solid granite Irish manor has 8 Bedrooms, 6 bathrooms, 8 fireplaces, 2 kitchens, and a grand room. 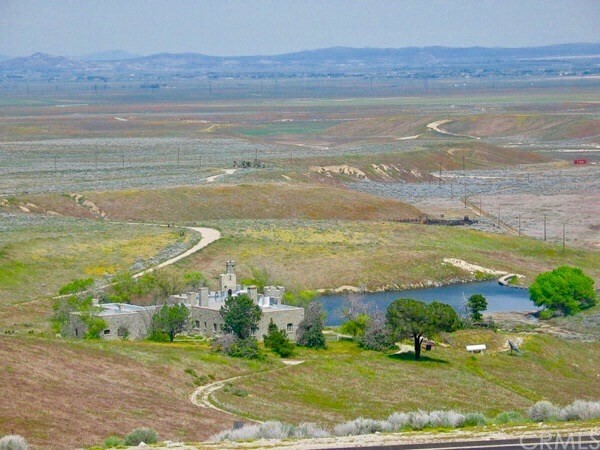 Sits on 506 acres of gently rolling hills and flat land (8 Parcels) that includes a 6-acre pond, retained by a magnificent stone dam, a solid 2500 sf granite stables, a 3000 foot long private airstrip, helicopter pad, native Indian petroglyph, natural spring wells, 1.5 miles of private roads, and 3 miles of fencing with a wrought iron gate. California Aqueduct runs along the southern boundary of the property. The Castle (a.k.a. : Shea's Lodge) has been featured in a number of journals and as a backdrop of a few TV/Movie productions.The property may be developed into multi-purpose development such as winery/craft distillery, equestrian use, sports camp, cattle ranch, etc. The property has the potential to be subdivided into 26 lots featuring a sustainable master-planned community of modern concrete and glass residences on 10+ acre lots. The property has commanding views of the California poppy reserve, the desert floor, and Tehachapi Mountains. This is truly a rare opportunity to invest or enjoy this unique estate and make it your very own. Motivated seller, owner financing available. SOLD AS IS." "This sleek tri-level residence offers plenty of room to spread out and savor. At the heart of the home, the kitchen, dining room and Great Room w/optional fireplace provide an open and comfortable living area for intimate dinners or lively parties. Just beyond, optional panoramic-style balcony doors and fireplace welcome fresh breezes and extend the home s living space outdoors. Upstairs, kids will enjoy a large bonus room for studying or watching movies or add an optional 4th bedroom Neighborhoods: Del Sur-HS 1015 Plan 2A Complex Features: ,,,, Equipment: Fire Sprinklers,Garage Door Opener Other Fees: 0 Sewer: Sewer Connected Topography: LL"
"This sleek tri-level residence offers plenty of room to spread out and savor. At the heart of the home, the kitchen, dining room and Great Room w/optional fireplace provide an open and comfortable living area for intimate dinners or lively parties. Just beyond, optional panoramic-style balcony doors and fireplace welcome fresh breezes and extend the home s living space outdoors. Upstairs, kids will enjoy a large bonus room for studying or watching movies or add an optional 4th bedroom Neighborhoods: Del Sur-HS 1017 Plan 2C Complex Features: ,,,, Equipment: Fire Sprinklers,Garage Door Opener Other Fees: 0 Sewer: Sewer Connected Topography: LL"